I joined the WELL in the fall of 1991. The WELL has a feature called a .friends list, people you've met online and want to know if they're logged in. Last time I looked, my .friends list had 79 names in it, people I wouldn't have known without the WELL. In August, 1995, I flew my plane from San Francisco to Fairbanks, Alaska and back. I wrote a report about the trip on the WELL. In July, 1996, my friend Frances invited me to double-hand a Merit 25 sailboat in the Pacific Cup race from San Francisco to Hawaii. It was an intense experience. We did well for first-timers, 19th of 68. After we survived that experience, we married in January 1997, and then moved to Stamford, CT.
For 15 years, I worked for Wells Fargo Bank as a systems analyst, designing and coding bigiron systems. COBOL and IBM were very good to me, but in 1995, I decided it was time to move on. I took some time off, to find myself outside my suit and cube, and wound up working at the WELL, on the conference team with Gail and -M-. Working at the WELL was a wonderful experience. It was like a dream, working in Sausalito, helping people communicate, solving problems, and watching the tides and birds along the shores. I learned much from Gail, M, and all the WELL folks. But my first love is teaching, so I left the WELL to teach flying at the Hayward Airport. I flew almost every day, working with students, watching them learn, and letting them fly off on their own. After almost two years, I received the FAA's Gold Seal award, for creating ten new private pilots with a 90% first-time pass rate. But things change. My wife Frances, a research scientist, received a great job offer from IBM Watson Labs near White Plains, NY. So now we live in an apartment in Stamford, CT, across the street from Yacht Haven marina, where she keeps her sailboat, and just down the road from the Westchester airport, where the trusty Skyhawk is parked. Everything I do seems to end up involving maps and teaching. 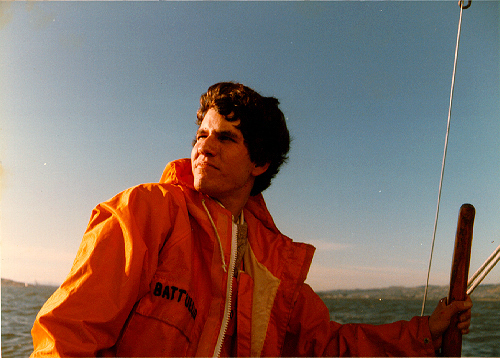 I learned to sail at the Cal Sailing Club in Berkeley, and I've taught sailing classes there for many years. Along the way, I also owned a Cal-25 sloop, Rainshadow, that I raced on San Francisco Bay. In 1989, a friend introduced me to light plane flying, and I was hooked. In 1991, I passed Rainshadow on to another loving owner, and acquired Orion , a Cessna 172 Skyhawk. I worked my way through the ratings through CFII (Flight Instructor, private, commercial and instrument). In the bay area, I was active in orienteering. I'm not active now, but hope to find an orienteering group in Connecticut. Frances and I live in Stamford, CT. Zap us some email - we offer boat rides, flying tours and great access to Manhattan! If you're on the WELL, drop by the flying conference and say hi. Or visit my friends in the sailing conf. To find out more about the WELL, try the gopher, or log on as a guest. Or if all else fails, send email to bb@well.com!